Ever wished you could make your own bookcloth out of some of the many wonderful cotton fabrics out there? Then you could use that cloth to cover your own art journals and sketchbooks. 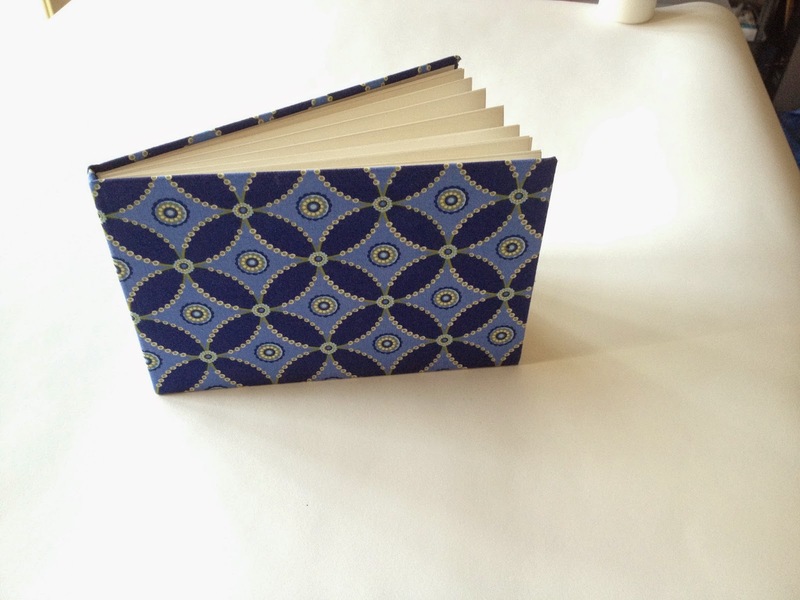 Perhaps even more fun than making books for yourself is making them as gifts for friends and family. If you know how to make your own bookcloth, you can pick out cotton fabric that really matches the personality of your loved one. That makes the handmade gift even more meaningful. You crafted it and you crafted it with them and their passions specifically in mind! Here is a book I recently finished for a friend for Christmas. The paper measures 8.5 x 5.5 inches and it is bound in horizontal or landscape format. This one contains Aquabee Super Deluxe paper, which is one of my favorites for multi-media work. 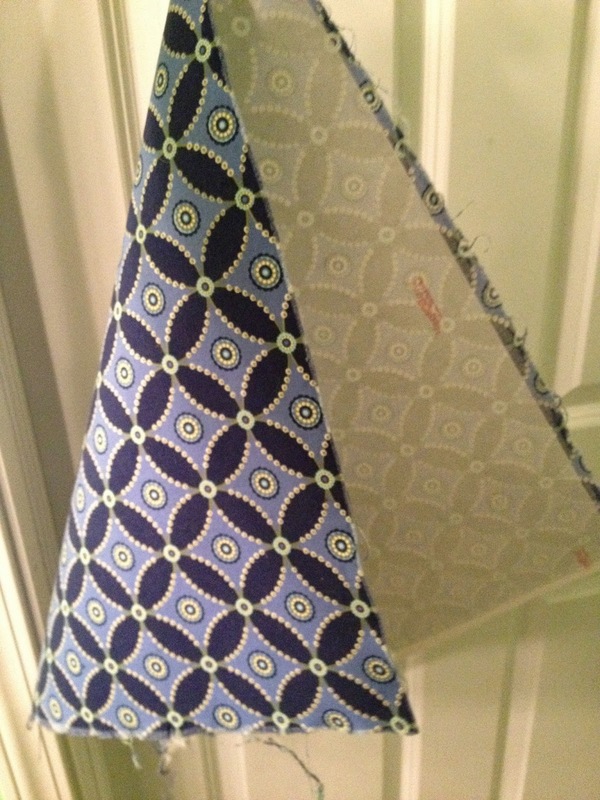 The super cool part is the bookcloth: this is a batik cotton fabric that she brought back from a trip last year. I asked for a scrap of it (about 11 x 21 inches) and used it to cover the book. But I could only do this because I knew how to make my own bookcloth. Did you know that you can't simply glue cloth to book boards--or else the glue seeps through the cloth and makes it look very yucky? That's why you generally need bookcloth--the cloth has a paper or impermeable backing that allows you to glue it to book board without any seepage! So how do you get that sort of on a fabric you just love? All you need to make the bookcloth is some lightweight cotton fabric, a product called Heat 'n' Bond Ultrahold, an iron and some scissors. I didn't figure this out on my own. I learned by using the wonderful tutorial YouTube videos by SeaLemon. She provides clear instructions for everything she presents. I recommend them highly. However! 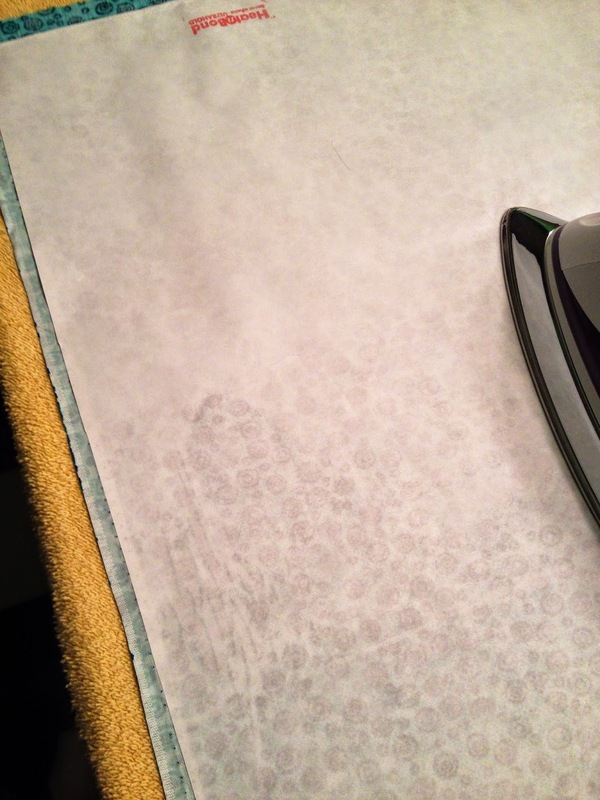 What I have figured out on my own are a few tips to streamline the process of bookcloth making. 1. A "fat quarter" piece of fabric (a cotton piece pre-cut to 18 x 22 inches and sold in most craft and fabric stores in dozens and dozens of colors and patterns because people use them for quilt-making), will cover two books based on 5.5 x 8.5 paper. You just have to bind the books with the same horizontal or vertical orientation. 2. Most people like the 8.5 x 5.5 size book. 3. 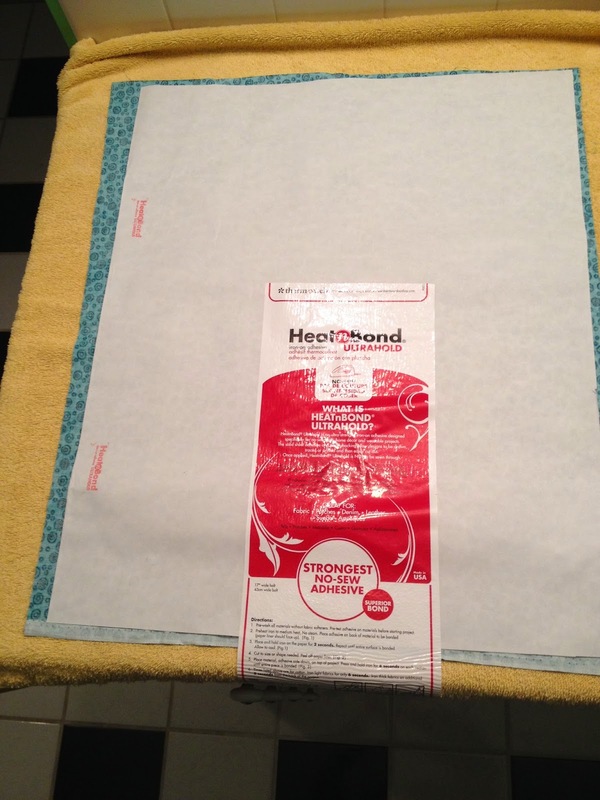 Though you can buy Heat 'n' Bond in pre-packaged amounts, I buy it at the local fabric store, where they sell it on a bolt. That way I can get an amount to match the number of fat quarters I'm planning to work with. Nothing is more frustrating than trying to make bookcloth and running out of one of the two most important components. 4. Cut the Heat 'n' Bond to match the fat quarter. 5. 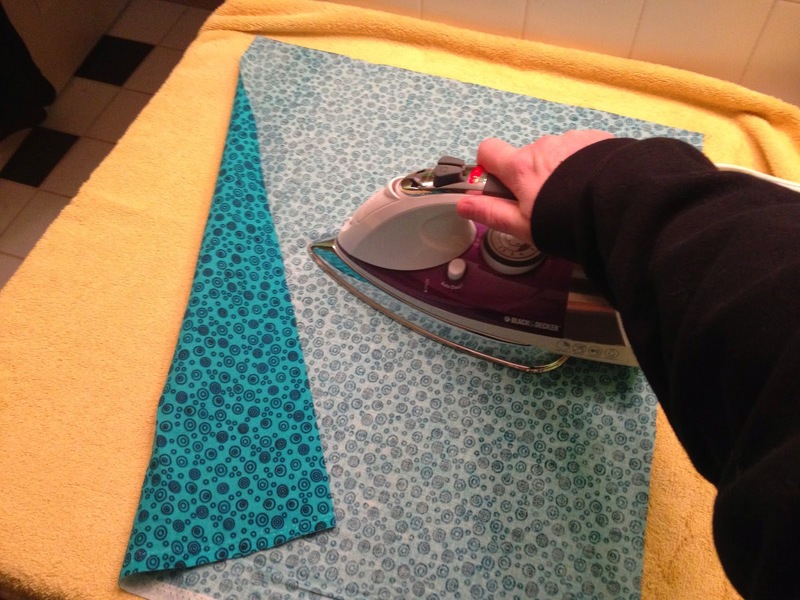 Iron the fabric so it is nice and smooth. 6. Carefully align the Heat 'n' Bond and start ironing it on. Important tip: go very slowly and pay particular attention to the edges. The instructions say each portion needs 2 second of heat to bond well, but I find it needs closer to 5 seconds, especially on the corners and edges. You'll know it is bonding because you will start to see the pattern of the fabric showing through the paper backing of the Heat 'n' Bond. 7. When it is all bonded, but before you turn off your iron, peel back a bit of each corner to be sure the bond is strong and the paper peels easily. When you are all done, you'll have a new piece of fabric with a nice, strong backing, ready to be glued to your bookboard and made into a book! 8. 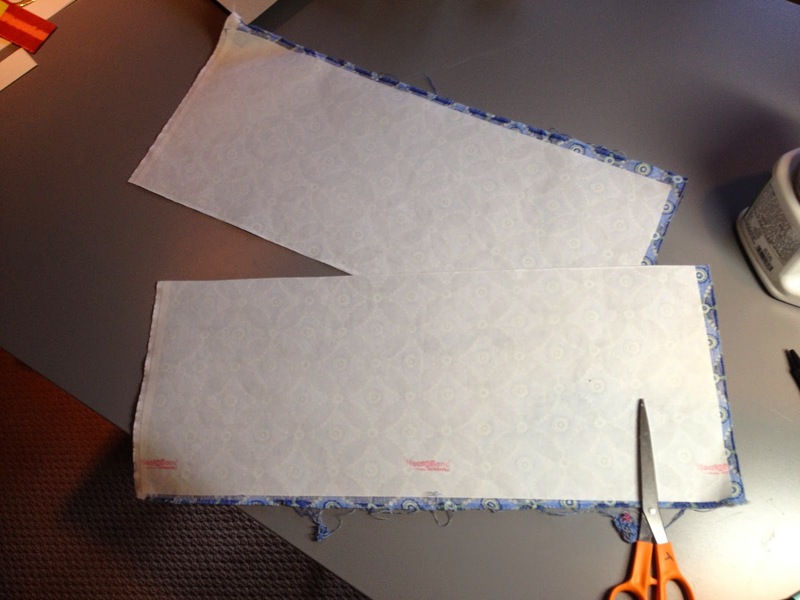 Cut the newly-backed fat quarter in half to create the cloth you'll need for two books. Here I cut it for two horizontal books. 9. When the time comes to actually cover your books, remember to peel the paper portion of the Heat 'n' Bond off! Then you'll apply your PVA glue and the cloth will stick beautifully to your cover board without the glue bleeding through! I will often do this to several pieces of fabric all at once, so the bookcloth is made and ready to go whenever I have time to put a blank book together. Check out the SeaLemon videos, add on the tips I have here, and you'll be making your own bookcloth in no time. Then, when you use it to cover blank books, art journals and sketchbooks just waiting to be filled, you'll have meaningful gifts to give to friends, family, and even to yourself! Life just has a little bit more meaning when you have new pen, doesn't it? Okay, well, maybe not really. But new pens, new art supplies, they do make scribbling and lot more fun! I ordered the Jinghao X-150 pen for myself (and a few extras to give as gifts) just before Christmas. I paid about $5 each for four of these pens on ebay and they arrived yesterday from China. I didn't have a chance to ink one up until today. I loaded this one with Noodler's Kung Te-Cheng ink (which you can buy at Goulet Pens). I love this ink. Unlike the Noodler's Bulletproof black, which I find to be waterproof sometimes and sometimes not, this purply blue ink has always been completely waterproof for me. The Jinghao nib flows quickly but didn't feel too juicy to me. It has a nice bit of flex to it. 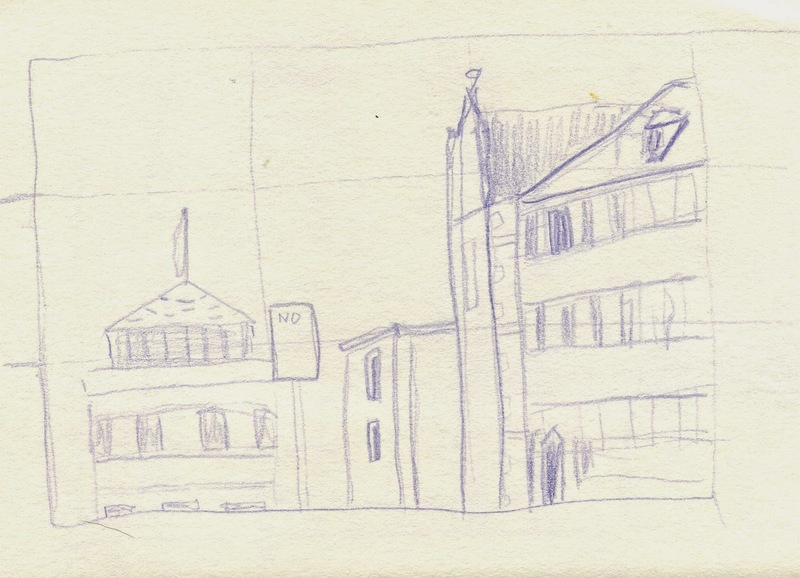 You can see some of the line variations in this quick (less than two minutes) sketch. I copied this quickly from the design on a soapbox I have and use to store pen supplies. I colored it with Derwent Inktense pencils because they were close at hand. Mostly I just wanted to see how the pen worked and to remind myself of the water resistance of the Kung Te-Cheng ink. I have a second x-150 which I will fit with a fine point nib from Goulet pens. I got the idea online from several people who say that combining the inexpensive but wonderful Jinghao pen with a higher quality nib produces an exceptional pen for around $20, so I thought I'd give it a whirl and see what happens. I haven't done that yet and will let you know what I find out when I do! One of the greatest lessons I've learned in Sketchbook Skool (everyone check it out!) involves how to approach scribbling something really complicated without a panic attack. Without quitting. Or without even walking away from the potential drawing before even starting because it will be too dang hard. Life is complicated. The stuff in and around us in life is complicated. Scribbling from life--whether in words or pictures or both--makes things a lot less scary, at least for me. And when I'm not busy being afraid of something, well, then, I have a lot more space in my heart and mind to let interesting things in! This month I'm starting the New Year off right by participating in SBS Bootkamp--a kourse of exercises designed for SBSers who have completed the three klasses. It serves as sort of a review and challenge. The latest challenge I tackled came from SBS co-founder Danny Gregory (everyone read his books! 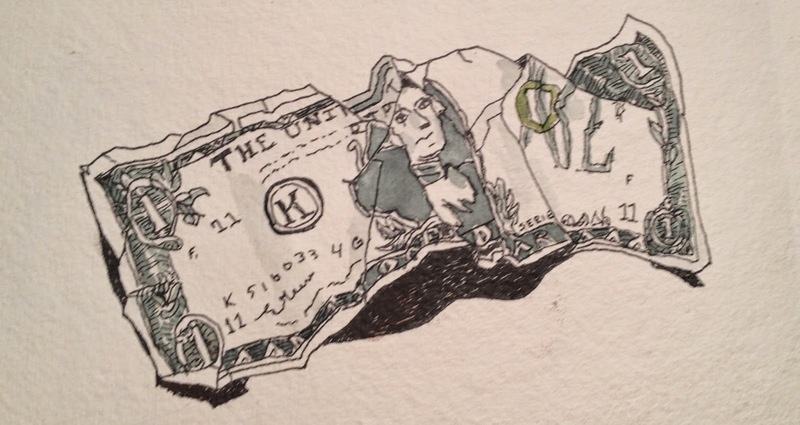 ): draw a crumpled piece of money. Money is complicated--in more ways than one, but here I mean in terms of drawing. You can see there is a lot of stuff to draw! 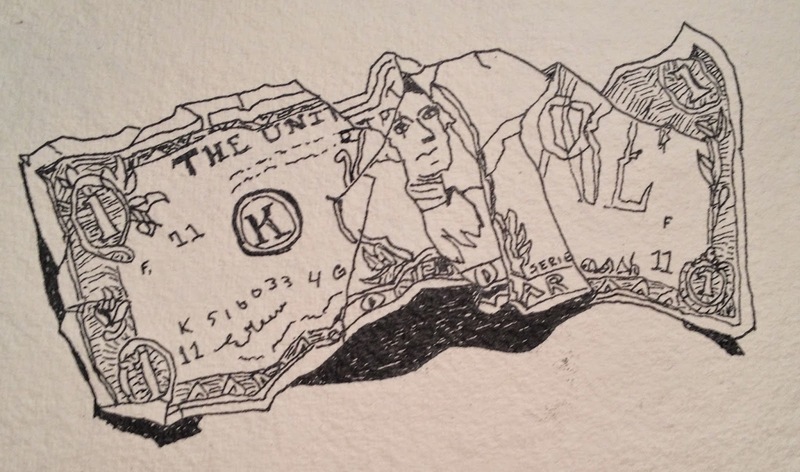 In fact, I never realized exactly how many tiny marks there are on a dollar bill before I looked at them and tried to figure out how in the world I was going to draw them! If you have read Danny Gregory's wonderful book The Creative License, you know that he advises drawing the outside shape of an object first. He advised that again the instructions for this exercise. This reminds me a bit of the advice to "start with the end in mind." There's something about getting the overall gestalt of a thing, or a task, in mind that helps me begin to see how one might get from beginning to end. It makes it less overwhelming to consider. Here is my initial outline scribble. Nothing too beautiful! You can see that I included the major shadows in this outline. 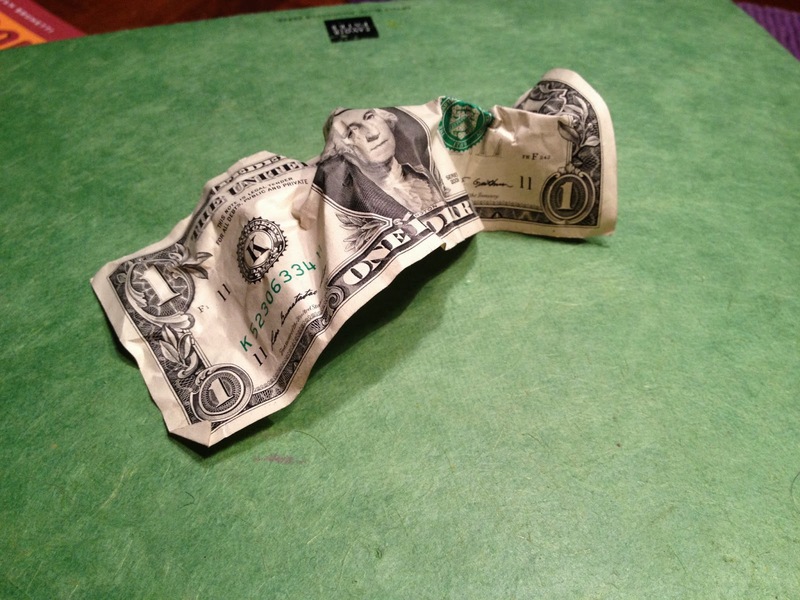 This helped me "see" the shape of the bill as it curled up off of the surface. The next step is to begin to mark off the large sections within the complicated object. 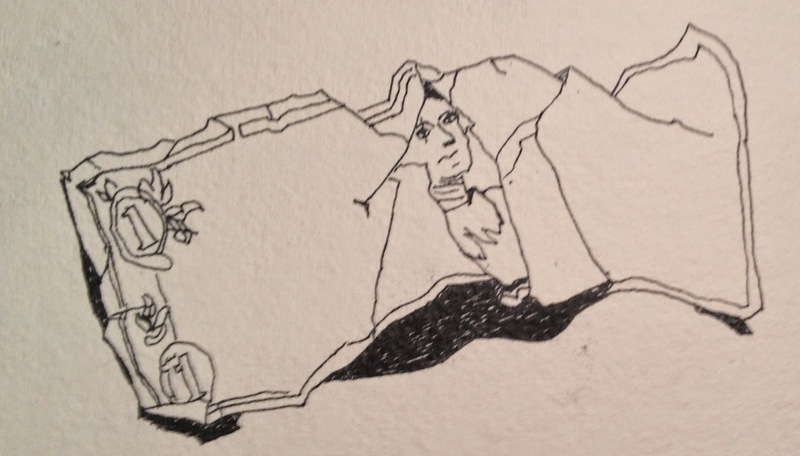 Actually, you can see that I started that in the above drawing, having delineated the major fold in the middle. I needed that line to draw the entire outline in proportion. But then I went on to find what, to my mind, seemed like the major sections. Scribbling the quick edges of George's face in there helped me clarify that messy center section--to begin to see what I was going to include and what I was going to leave out. No way could I catch all the details!. Then, I started with the numbers in the corners and began to slowly work inward. Not sure why. It just made sense to me as I tried to keep things in proportion. I wanted to be sure everything would fit! Finally I finished all the line work. I had decided that I was not going to do any tonal work--shading--with the pen because the bill itself contained so many fine marks. Instead I would let watercolor wash do that for me. By the way, I did this ink work with my new $5 Jinghao fountain pen which I have fitted with a $15 Goulet Pens fine nib. Wonderful drawing pen for $20. And I used Platinum Carbon ink because I know it to be utterly waterproof. Here is the final drawing. It took me about 45 minutes from crumpling of the bill through washing my brush. That included several minutes at the start of looking at the thing and dealing with some mild "I can't possibly do this" panic. But here's the thing about Sketchbook Skool Bootkamp (and taking classes in general, at least for me): you can't question what the drill sergeant or teacher tells you to do. I want to get better at this scribbling thing. So I decided I just had to do it. Besides, really, so what if I completely screw it up? I just get to do it again! Today I thought I'd share two of the best online videos I've found to help me paint figures into my journal and sketchbook work. Both of these emphasize suggesting figures and not getting too anxious about faces and other details. First, is an episode of Drawing with Robert Burridge--How to Draw Figures in Landscape. Carrots! Who'd a thunk it? This is one of the many art tutorials available on Cheap Joe's Artists Instructional Videos. The second one I have found helpful is How to Paint People Using Watercolors featuring artist Chuck McLachlan. This one makes me laugh out loud as the artist gives each figure a name and a bit of backstory (including bad breath or a bag purchased on sale). I also appreciate the emphasis on practice in this video--no worries about being perfect the first or even hundredth time. "As long as you practice... they only take you a few minutes...and you'll get to where you're pretty good at it!" I appreciate that sort of encouragement. This is one of the many tutorials from Jerry's Artarama. Hope you find these as delightful and inspiring as I have. Sketch some blob people with no expectations--just let the figures emerge. Then, using the picture as the prompt, write a bit about who they are, their strengths and flaws, their relationships and triumphs, their fears (listen to Chuck McLachlan do it as he draws). Can you develop characters for a piece of fiction this way? 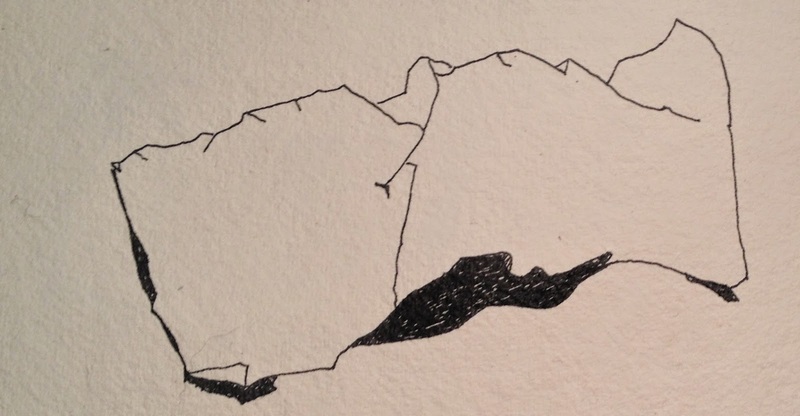 I chose the idea of "scribbling" for the name of this blog because it refers to both drawing and to writing. Sketching connects to scribbling. Writing does too. Doing both "with spirit"--with a certain vitality and inspiration and sense of meaning greater than ourselves--what a worthy goal for our sketchbooks and art journals and creativity! Recently I did a scribble--an ink sketch-- in my sketchbook from an old family photo of my grandmother fishing. As I mentioned in an earlier post, creating this piece brought back a lot of memories of my grandmother, my grandfather, that boat, our adventures in it. It also helped me appreciate again the love of the wilderness which they share with me when I was little. 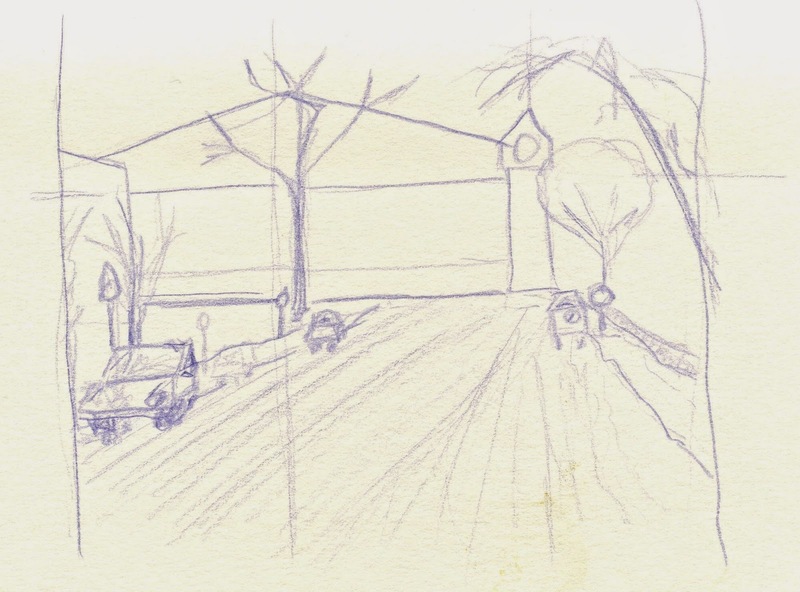 A day or so after I completed the sketch, I found myself still enjoying the memories--seeing connections between my life now and what I saw and admired in their lives then. That inspired me to sit down and scribble some more: this time verbally with three ten-minute free-writing exercises. If you want to learn more about this kind of short scribbling sketching (with words) exercise check out the wonderful books by Natalie Goldberg (who is also a painter, by the way). Also check out Tom Romano, Lynda Barry, and of course, Anne Lamott's amazing book Bird by Bird. These folks inspire a lot of the exercises I develop for myself and my students. Anyhow, the exercise, as I set it up for myself, was this. Looking at the picture, choose one concrete, tangible object. Write that at the top of a page, as if it is the title. Set a timer for 10 minutes. Go! Write like the wind. Do not stop. Let the words take you wherever they will. If you get stuck, write the object down again and go! When the timer goes off, finish your sentence and stop. Third, same as the second step. New piece of paper... set the timer... write like the wind! The metal seats on the blue boat got so hot in the sun. Fishing in the summer time smelled like fish and worms and dirt and pond water and cigarette smoke and hot sun on hot metal and skin on hot metal and sunburn and suntan lotion in all of its coconutty goodness. Sweaty thighs stuck on hot metal seats and squirming until the metal cooled beneath us. Worms squirming in the dirt, in my grandfather's thick fingers, around and around the hook. Poor things. Bobbers red and white on the brownish greenish pondish water. Mountains behind the trees, the mountains where my people came from, where I was born, but which we left when I was only two or so, seeking jobs elsewhere, where there were no mountains. Though still ponds. Only, really, I never fished anywhere but here. Okay-- so that is my completely unedited scribbling for part one above. For the second part, then, I have a ton of concrete images to choose from: metal seats, hot, fish smell, worm smell, dirt smell, cigarette smoke, sunburn, suntan lotion, sweat... and so on. It doesn't matter which of these I choose for part two. Pick anything that seems interesting in the moment. Then go. What do you do with it when you're done? Well, same thing you do with your draw scribbles and sketches. Examine them. Appreciate what is wonderful about them. Keep them. Share them or don't share them. It almost doesn't matter. It is really all about the paying attention and then articulating--scribbling--our thoughts and observations about what we've paid attention to. That is how we make meaning of the building blocks of our lives. Last week I mentioned how the end of the old year and the beginning of the new inspired so many of us to reflect on who we have been and who we want to become in the future. We hang out with family and friends. We make New Year's resolutions. Feeling sort of nostalgic, I sketched from an old photo of my grandmother fishing. Here, again, is the ink only version. Focused sketching sessions always bring a sort of meditative calmness to me. I feel energized by engaging so closely with whatever I'm drawing. So it was especially fun for me to reconnect with memories of my grandmother (and by association, my grandfather) and the many outdoor adventures we had when I was a kid. I thought a lot more about all of that as I painted the sketch. Ah! I remember that blue rowboat well. I remember how hot those metal seats got in the sun. I remember the way the bucket of worms and earth smelled whenever I baited my hook. I remember what the worms felt like in my hands and how I always felt that there was something wrong with this whole fishing enterprise, hooking innocent animals for fun. I remember the boat sitting on a trailer in my grandparents' back yard. That let me to remember all the fun and games we had in that back yard. And I can remember my grandmother clucking around, always packing food and drinks, always making sure she looked good, always checking out what we kids were up to and fully entering in to our world the way we saw it. Loads of specific memories--things I hadn't thought about in ages--flooded me over the several hours it took to draw and paint this little sketch. Memories I'm still enjoying days later! I understand so much of who I am and what I value and how I interact with other people, especially little kids, because of who my grandmother was and how she treated me. Doing this sketch reminded me of how I came to value some of the things I believe are so important. And it reminded me that I need to tend to those things in the year to come. So if you are ever looking for ideas about what to draw... or if you ever wonder how drawing can help you think about who you are, where you've come from, and what you want your next year's resolution to be... consider drawing from old photos. 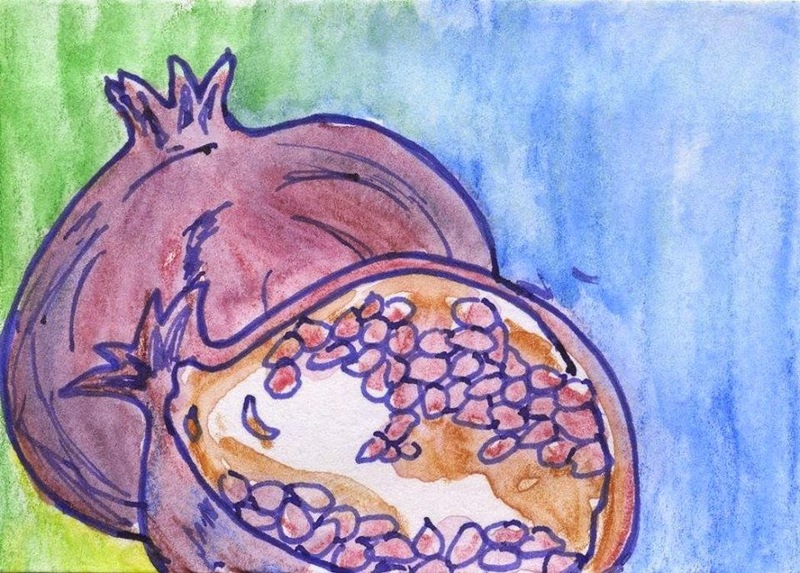 My sketchbook and my understanding of life are the richer for it! The end of the year. Many of us see more of our extended families than we normally do during the holidays. And many of us spend some time reflecting on the year coming to a close and the year ahead. We make New Year's resolutions because who we have been has led us to a who we are that we'd like to change in the future. What is the meaning of life? How will we tackle that going forward? Through the wonderful community of sketchbook keepers at Sketchbook Skool, I've seen that many folks who mostly draw from life occasionally turn to an old family photo for sketching inspiration. Some have shared that by drawing pictures of themselves as children, or of family members in their early lives, they have had lovely meditative experiences. Some have come to new appreciation of their own lives and the lives of others. Recently I decided to give it a try. I have a favorite photo of my grandmother fishing from sometime in the late 1960s. My grandfather was head of the Pennsylvania State Fish Commission and a committed fisherman, and she sometimes joined him. Here is the result, ink only. This took me about two steady hours of work. I didn't abstract or guess at anything. I drew--as exactly as I could--the shadows in the water, the checks on her coat, the pine trees in the background. I don't always sketch in this super-detailed "Tommy Kane" way. For one thing I don't have the time. 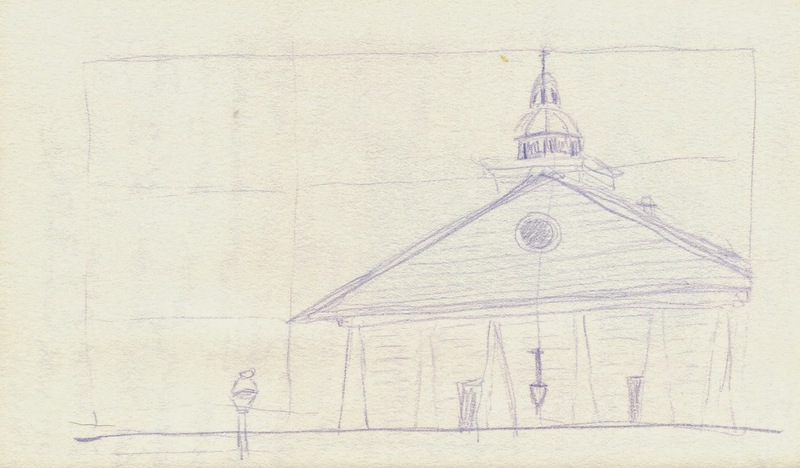 But doing it for this sketch of the old photo provided the perfect quiet reflection for the end of the old year and the beginning of the new. 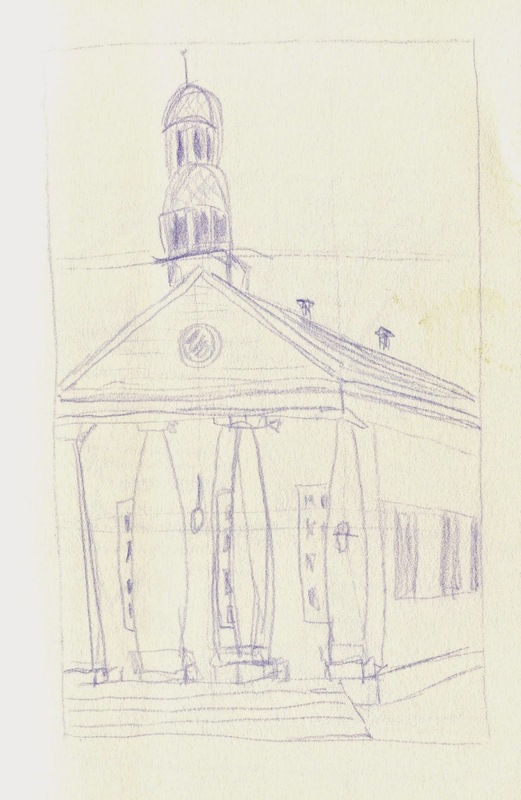 I'm still thinking about those things, letting them percolate as I contemplate how to color this sketch. I hope to report on both soon! Sketching really does help me contemplate the meaning of life! And how the lives of others have influenced mine.